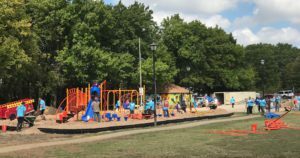 Lancaster Mayor Marcus E. Knight, local officials, community volunteers, sponsors and sports celebrities worked together October 13 to build a 3,036 square-foot KaBOOM Playground at Kids Square Park. Kids Square Park is located at 1990 W. Belt Line Road in Lancaster. Official opening ceremony for the playground will be held Wednesday, Oct. 25. 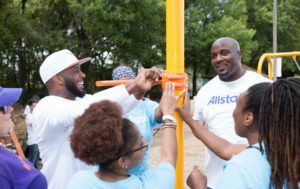 Participating in the build were Director Sponsorship Integrated Marketing Communications at Allstate Dan Keats, former Texas University running back Priest Holmes, and former University of Oklahoma (and Dallas Cowboys) safety Roy Williams. The two football players also led football drills for 36 local kids. The team of 286 volunteers included local Allstate agents, KaBOOM staff, city staff, council members, local police and fire department members, CVC Suns baseball team, Lancaster High School (drumline, basketball team, cheer leaders, and 2018 senior class members), Lancaster Senior Life Center, Lancaster Parks & Recreation staff, local residents, and out of town visitors. City officials said the volunteers mixed more concrete than the weight of four adult Indian elephants and one baby Indian elephant. They also built six playground games. 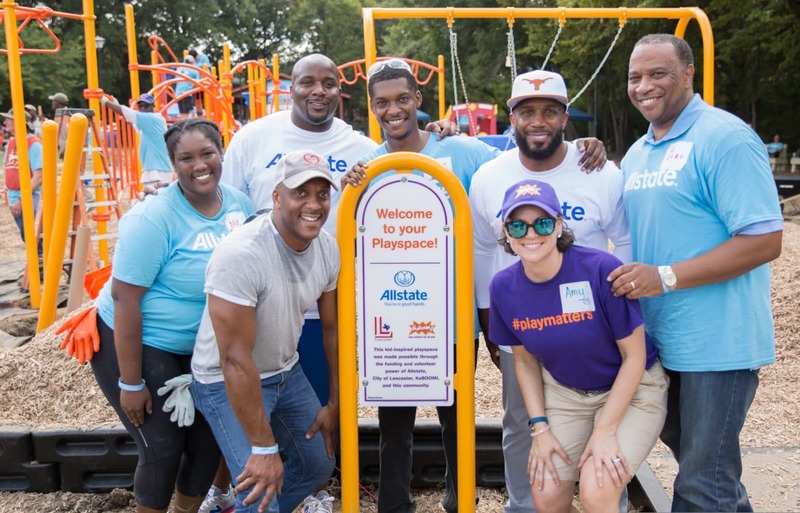 Allstate is a corporate partner with KaBOOM, and was designated to support KaBOOM and Lancaster in this playground build. Allstate representatives said the build was part of Allstate’s season-long All Hands In program, an initiative that highlights the passion in college football to give back to local communities and bring rival fan bases together – because when fans come together good things happen.